Want to retire early? Looking to be financial independence? Join us on our journey to F.I.R.E. We post tips and tricks for those we want to attain early retirement. 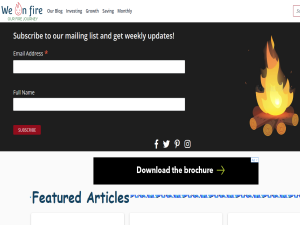 This what your We on Fire Blog Ad will look like to visitors! Of course you will want to use keywords and ad targeting to get the most out of your ad campaign! So purchase an ad space today before there all gone! We are excited to announce a new feature for the site! This new feature has been a long time in the making. we are pleased to launch FIpedia on We on FIRE. New article post New Blog Feature: FIpedia! appeared first on We on Fire - Our FIRE Journey. We are excited to announce a new feature for the site! This new feature has been a long time in the making and after several months of designing, developing, and endless hours of working over the weekend, we are pleased to launch FIpedia on We on FIRE. You probably noticed the name is a wordplay on Wikipedia. We merged FI (financial independence) with the last part of Wikipedia. Why not FIREpedia? That’s because we not every personal finance blog out there is a FIRE blog so we can want to encompass all financial independence related blogs. The idea behind FIpedia is to have a collection of searchable articles dedicated to financial independence from personal bloggers. You can find FIpedia link in the navigation menu. We made it so that it is similar to a news feed and at the same to have a searchable database of financial independence articles. There are many fantastic FIRE blogs out there ranging from the classic Mr. Money Mustache or RetireBy40.org to new blogs like ours. However, with more and more articles, who have time to check every blog for new articles. To add, if you want to read more articles on certain topics, it is very time-consuming to find articles within each blog. What if you can search all personal finance articles by category or by publisher all in one place? That is what FIpedia aims to do: to have an easily searchable database for the financial indepedence community. It is 2019 and I think we can have a easy to use and modern blog feeds for all. Hot – This filter shows the most view articles of the month. This will be changing monthly. Trending – The trending filter shows the top article viewed the most for the week. This will be changing weekly. Newest – The newest FI related articles. Our community latest and greatest stories. When you click on an article that you want to read, it will take you to the original blogger’s site. We hope this will support our FI bloggers community. The top articles do not give you the information you want on your specific topic? Try to use the search! It’s located on the right-hand corner. You can search Fipidia by categories, authors or a text search. The search also has an auto-complete feature! It will display a list of available authors or categories after you type 2 letters or more. I think this feature is pretty neat so you know what categories and authors you can search for. If what you are looking for isn’t there, you can always do a text search of all articles. Don’t See Your Favorite Finance Bloggers? You can contact us to add new blogs. Any feedback or ideas you want to see on FIpedia, let’s us know by connecting with us! New article post New Blog Feature: FIpedia! appeared first on We on Fire - Our FIRE Journey. Are you thinking about why people are trying to pursuit financial independence? Here are some reason to help you make the decision. New article post Is Financial Independence Really Worth It? appeared first on We on Fire - Our FIRE Journey. I want to inform you right off the bat that I am biased toward this question because I’m working toward FIRE. So…YES! I do think it is 100 x to infinity and beyond worth it. If you have been reading this blog then you know that all we talk about is FIRE on here! We are all about living our lives on FIRE! While some of you might not agree with Retire Early part of FIRE, I think we all can agree on the Financial Independence part. There are many reasons why I believe that everyone should choose FI. Took a look around when you go to Walmart, Target, or McDonalds. There are self check out machines in all the stores now. This little machine is doing a job that a human used to do. Amazon is coming up with technologies to have ZERO cashiers where you can just walk out of the store without scanning your items or even having to get in line. The first store opened in Seatle available for Amazon’s employees only to test out the functionality. My guess if everything goes well, we will have 3.4 million cashiers out of a job within 20 years. Self-driving car = no more truck driver or bus driver. 3D printing = houses can be built much quicker and for less. We are only scratching the surface of thousands of inventions that will change our lives. Making our lives easier by removing humans from the process. Robots don’t feel tired and won’t complain about being underpaid or unfair labor practices. An argument for this is one job disappear then another will pop up. For example, who will maintain those self-driving cars? Indeed new jobs will be created but it will require new skills and most of them require high tech skills. We have moved on from the Industrial revolutions and is in the midst of a new knowledge revolution. So the next big question is will you be able to adapt? Will you have time and money to learn a new trade? One of the first few paperwork that almost everyone has to complete when they start a new job is the “at will” employment. Meaning, the employers have the power to dismiss employees at any time for any/no reason, without any warnings, as long as the reason is not illegal. At the same time, employees have the right to leave the company at any time. During the economic downturn, there is a high chance that your company will fire you. If you are lucky, the company will provide some compensation. According to CBPP, 8.7 million Americans lost their jobs during the 2008-2009 economic crisis. By the 1990s, private companies no longer offer a pension which is funded from the company own money. Pensions were determined by age, salary, and number of years with the organization. For a less costly approach, some companies offer 401k to help with your retirement plan. This plan mainly funded by you and your company will contribute a minimal amount. There are many people who found their dream job. It makes them happy to wake up in the morning, go to work, feel accomplished. For those people, I would like to say kudo guys because you are living your dream. Sorry, but my next feel sentences are going to bring us back down to earth. Let’s say you love your co-workers and boss. What if one day these people leave the company? What if your perfect company got bought out but a company you hate? When tomorrow comes, will you still like where you work? You might be stuck with new horrible co-workers/boss 8 hours a day, 5 days a week, and 12 months a year. That would be 1920 hours in a year (not minus the holiday)! That’s a lot of time spending with people who you dislike. In a working day, you will spend 10-12+ hours focusing on your job. (9 hours at the office + 2 hours commute +/- overtime). For my job, I used up 10 hours a day. In 24 hours time, I sleep for 8 hours, self-grooming for 1 hour, and cook/clean for 2 hours. Total free-time that I have every day is only 3 hours. I spend 41% of my total time (10/24X100) at my job. While only giving 12.5% (3/24X100) to engage with the people that are closest to me. Most of the days, when I get home from work, I would be exhausted to actually spend any quality time with my family. People always say kids grow up in a blink of an eye. This perspective is true because most of our attention goes into unimportant things. If we switch our time from spending it at our job to spending it with our family (41% with family and 12% for a job), we will see that the kids are growing much slower with many more blinks of an eye. Choosing Financial Independence will give you security and more time to do what you really want. If you are not financially independent, most likely, your life is in someone else control. Your financial life has a questionable future. However, it doesn’t have to be a mystery if you start planning for your freedom now. Do you think Financial Independence is worth it for you? New article post Is Financial Independence Really Worth It? appeared first on We on Fire - Our FIRE Journey. Velocity banking is a great concept to pay of debt quickly. However, it is not a method that anyone should use. Here is why VB won't work. New article post Why Velocity Banking Doesn’t Work appeared first on We on Fire - Our FIRE Journey. Velocity banking is a great concept to pay of debt quickly. You can read What is Velocity Banking to learn the basic. I have written articles on How to Pay Off Mortgage Quickly Using Velocity Banking and Investing in Real Estate by Using Velocity Banking. However, these articles did not address when velocity banking would not work. There are numerous reasons why you should NOT use velocity banking. Here are some reasons why you shouldn’t use velocity banking. In order to sign up for HELOC or LOC, you will need a good credit score. Without a revolving line of credit, you will not be able to carry out the velocity banking process. When you use velocity banking, every time you pull out a large amount for chunking (a term that means taking money from HELOC/LOC) your credit score will go down. The first time I used my LOC, my credit score was 770 and it went down 100 points to 670! This was pretty shocking to me. After 1 month of paying off my LOC, my credit went back to 770. The second time I took money out of my LOC, my credit only went down to 730. I noticed the more you use your LOC the less fluctuation your credit score will have when pulling out loans. As you can see, if you have a 600s credit score range, using a HELOC/LOC will cause your score to go down to the 500s! This will be a roadblock if you are planning to apply for other loans like buying a house or a car. This one is a no brainer. If you do not have any leftover cash after you paid off all of your monthly bills including mortgage then you do not have a positive cash flow. Positive cash flow means you have extra income leftover after minus all your expense. For example, if I have a monthly income of $5,000 and my monthly expenses is $4,000 then that means I have a monthly positive cash flow of $1,000. Without positive cash flow, how are you suppose to pay off debt anyway? Before considering using velocity banking, you will need to work on your spending issue and save more. You can read How to Make it Harder to Spend in 5 Easy Steps for ideas. If saving is not your cup of tea, think of ways to get a bigger paycheck. Check out How to Get a 45% Raise in One Year if you want to increase your salary. Velocity banking works great during the start and the middle of your mortgage. However, there is a tilting point where velocity banking will not help you save money. The tilting point is when you are starting to pay more of the equity than the interest. Near the end of your mortgage term, most of your payment will already be paying toward the principal of the loan. Taking money from a LOC to help with a mortgage payment, will not help you save much since you’d paid for most of the interest at the beginning of the mortgage term already. You can see my calculation by reading How to Pay Off Mortgage Quickly Using Velocity Banking. Yes, you can use velocity banking to invest. Some people like velocity banking concept that it use other people money to invest. While it is true, you are getting money from the bank but you still need to pay back the money you borrow. In the end, you are using our own money to pay back the bank plus interest but at a later time. You can fall flat on your face if you are not financially secure when you cannot pay back the loan. For me, it usually takes ~4 months to pay off 15k of debt. Within these 4 months, I make sure 100% that I don’t lose my job because that’s the only income stream I currently have. Remember, the money that you borrow you will need a plan to pay it back. If you put the money into a risky investment, there is a high chance you will need to come up with extra money to pay off the debt. One of my friend, who I taught the velocity banking concept decided to use it on stock option. Instead of gaining enough money to cover the borrowed money plus interest, he lost about 50% of the borrowed money. Now, he has more debt to pay off monthly. Personally, I also used velocity banking to buy stock. My outcome has a happy ending but it was a bumpy ride. I took out the money to buy total stock market index with the plan for long term hold during November 2018. If you were keeping an eye on the market during this time frame, the stock market was tanking in December and recovered in February 2019. Yes, during these months I was a bit worry about the market crashing. Since my mindset was holding it for the long term, I stay on the stock fluctuation ride. I would not recommend this strategy for other people. Velocity banking can be useful if you use it correctly. However, it can cause you a lot of headache and money if you don’t understand the risk you’re getting yourself into. Learning to use velocity banking correctly can be a daunting task. There are many requirements in order to use velocity banking. You need to have a good credit card, a positive cash flow, and disciplines to pay the borrowed money. You also need to invest the money wisely as well and don’t. What are you planning to use velocity banking for? New article post Why Velocity Banking Doesn’t Work appeared first on We on Fire - Our FIRE Journey. P.S. Day trading is very risky and it is not recommended for lighthearted people. Recipe for this month that went well is vietnamese style caramelized salmon (ca hoi kho). Smart and Final were selling wild caught salmon fillet in a bulk $25 for 5 pounds! We could not resist the deal. Now, we learned how to make a good salmon dish. Mr.WoF’s company had a discounted event with some amazing deal! Even though we did spend a little but we were able to get deeply discounted tickets for things we were going to do anyway. The upside is that these have a one-year expiration date so we have plenty of time to use them this summer. For example, one of the amazing deal we got is 4 days and 3 nights in Las Vegas for only $70 dollars! Time to start planning for our next vacation. Testing my luck again by day trading and lost $20. I need to learn not to be too greedy and sell when there is a gain. I made two mistakes this time around. The first mistake is not buying enough share. I only bought 100 shares. The second mistake that I made was being too greedy. I already had a gain of ~3% already but I wanted more. I held on to the stock longer than needed and ended up with a loss. I also didn’t realize 3% is already a lot. One of my bad teeth requires a root canal and a crown. This dental problem caused me so much pain. At first, it started with just a toothache. After that, the pain spreads down the nerve, to my throat and up to my head. I had to take antibiotics and a lot of painkillers. An estimated cost out of pocket for the root canal and the crown is $700. Good thing I’m prepared for healthcare cost with my HSA contribution. I wish that healthcare could be free though. The stock market is up again this month! I used trailing stop for the first time. I put in a low trailing stop percentage and my stock sold on the first day that I configured the trailing stop. This mistake cost me a higher tax for the short term capital gains because the stock is not yet 1 year. And I only needed to wait 1 more week for the 1-year mark for the long term capital gain. In addition, the lost opportunity cost me more than my gain. The overall market went up further after I sold my stock. I essentially missed out on ~2k of extra gain. Lesson learned about the trailing stop is to have a higher buffer of at least 1% for total market stock (I put in 0.4%). Boeing stock dropped more than 10% immediately after the Ethiopian 737 Max air crash. It is very unfortunate that two 737 Max plane crashed within months of each other. I’m very sorry for the victims and their family for the lost of a loved one. However, Boeing will not go down just because of this one bad mishap. 737 Max isn’t Boeing only plane that they are not going anywhere. Mr.WoF picked up some Boeing shares this month and their shares are up 5% since. Following my goals, I hosted open houses in Fremont this month. I did receive a few contacts from interested buyers. However, none of the buyers would follow up so those lead to nowhere. Nonetheless, I will continue to provide useful information to these people. Hopefully maybe, one day, they will call maybe me (reference to a pop culture song). Our expenses went up a bit this month due to our snow trip. We are also in the midst of rebooking our China room accommodation (coming up in a few weeks!). We decided to book Airbnb instead of a hotel because it is basically half price. Nothing is out of the ordinary except for the travel expense. We will be getting some money back when we cancel the hotel reservations. We are going to visit China with Mr.WoF’s parents. Wish us luck guys, this is our first trip with the parents. April financial update going to contain a lot of expense from our travel. Our overall net worth increased by 2.26% this month. We are slowly and steadily building up our investments and assets. We have not increased our contribution to 401k as much as we like because we think the stock market is pretty high right now. We are still trying to increase our passive income by investing in CRE and working on our side hustle. New article post Our Financial Reflection – March 2019 appeared first on We on Fire - Our FIRE Journey. Applying for a Home Equity Line of Credit (HELOC) or a Line of Credit is the usual path to get started with velocity banking. Those of you who have a house can apply for HELOC. If you don’t have a home, then you can’t apply for a HELOC and have to apply for a LOC instead. However, a LOC can be difficult to obtain because of the high credit score requirement. These loans are less common than a credit card which is also considered as a revolving line of credit. The next best thing would be using a credit card (CC). What type of CC is best for velocity banking? Below are the criteria that I look for when choosing a CC to use for velocity banking. Some banks charge as much as a 3% fee for balance transfers. I would stay away from CC with such high fees because 3% of 1k is $30! That’s a lot of money that would only go toward feeding the banks. You can look at MagnifyMoney for a list of 0% balance transfer fee CC. I would choose a zero balance transfer fee over a low-interest rate (see reason below). In my opinion, this would the most important factor because you will need to do a lot of balance transfer. Note: Many credit card only gives you 1 free balance transfer. Read the fine print before carrying out your velocity banking plan. Without a high credit card limit, it would be very difficult to carry out velocity banking. You need a limit that is higher than your monthly expense plus the amount that you are planning to use for velocity banking. If you can get more, that’s even better! For me, I am using a CC that has a 25k credit limit. This gives me a lot of buffers when I take out a chunk of 15k each time I do velocity banking. I know 100% for sure that I won’t go over my credit limit and I’m covered for any unexpected expense. There are a lot of credit cards that won’t charge you any interest for 12 months or more. You should apply for credit cards with this sort of bonus because you will be able to pay off a large amount within the 12 months that you apply velocity banking. For 2019, you can check out CreditCard.com for a list of 12+ months CC interest-free cards. When you apply velocity banking, the interest rate does not affect the ability to pay off debt faster. You can see my calculation in How to Pay Off Mortgage Quickly Using Velocity Banking where I used a 20% interest rate CC to pay off a 6% interest rate mortgage. Yes, it sounds ridiculous but with velocity banking, the number doesn’t lie. In short, you don’t have to worry about interest rate but having a lower interest rate would help you save even more. TIP: Credit Unions can give you a better rate than name brand banks. As of 4/1/19, Navy Fred offers 8.24% CC. There is a big difference between balance transfer and transactional credit. First, a balance transfer is from one credit card to another credit card. Transactional credit is when you normally buy anything with your credit card. Most credit bonus promotion is for 0% interest on transfer balance but NOT on transactional charges. This mean, you might be paying no interest on your balance transfer but you will still pay interest on purchasing charges. When you are paying off your credit card, you don’t get to choose to pay off the transfer balance or the transactional balance first. Therefore, you should be careful when using your CC to pay bills. TIP: I don’t use my velocity credit card for my daily needs. I use Chase Freedom as my daily card and to earn points. Then, I balance transfer to Navy Fred CC. If you need to pay a credit card bill, you will need to do a balance transfer from the CC that you are using for velocity banking to your other CC bills. Remember, there might be a balance transfer fee if you don’t have a 0% balance transfer. Paying utility bills are easier because most would accept CC payment in my experience. P.S. This might count as transactional payment. The only problem (more manual than problematic) is paying a bill with cash. You can’t use your credit card for cash payment. This presents a problem because velocity banking relies upon lower interests by parking your money in the LOC and using that to pay for everything else end of the month. The room that I’m renting I pay rent in cash-only. Therefore, not 100% of my paychecks are deposited in the velocity banking CC. Even if you live in an apartment, most likely they don’t accept CC payment either. This problem does not exist if you have a HELOC/LOC because you can write checks to pay from the HELOC/LOC which act like a checking account. After a long search for the perfect card, I did not see any CCs that have an annual fee making it to the list. Usually, CC that has an annual fee are cards with high reward for high spending people. Even though you balance transferring a large amount of money, the balance transfer does not count toward the reward earning. Therefore, there are ZERO benefits for you to sign up for a CC that has an annual fee. You don’t necessarily need a HELOC or LOC in order to do velocity banking. Although, it certainly does make things a lot easier. However, some of you might have a hard time getting a LOC so using a credit card might be a better idea. Please beware that velocity banking is not for everyone and if you do not fit the requirements for it then please do not attempt to use velocity banking. You will only dig yourself a deeper hole. I’m currently using Navy Federal Platinium Credit Card. There is no balance transfer fee and no annual fee. The interest is low and I have a good credit limit. Your velocity banking process will be less of a hassle if you consider all of the points above before deciding on a credit card. Happy hunting for your CC. New article post Choosing A Credit Card For Velocity Banking appeared first on We on Fire - Our FIRE Journey. While we are working toward FIRE, we also learn how to make fun and frugal trips. Here is how we plan our snow trip for 12 people! New article post How to Plan a Snow Trip for 12 People appeared first on We on Fire - Our FIRE Journey. There are a lot of misconceptions about how FIRE people don’t have any fun. They only work, save, and invest. However, that’s not true. I think we enjoy life as much as any other people on the planet while working hard toward our FIRE goals. We hang out with friends and go eat out at a nice restaurant here and there. We attend birthday parties and friends’ weddings. And some of these activities aren’t cheap you know! So yes, we on FIRE do have fun but we just don’t indulge in them every day or participate in activities we find meaningless. Recently, this March, we planned a 12 people snow trip on a budget! We shared the cost with our friends and had a blast. Here is how we planned our snow trip. First, we need to invite people to go on the trip. We do not recommend inviting people who you do not know well. One question that I asked myself when I’m inviting people is did I had a drink with this person before. Since it is an overnight trip, people are going to be spending at least 24 hours together. There is going to be a lot of drama if people don’t get along with each other. Using this rule, it was easier to say no to friends who recently found their partners. The second rule that I made is for people who are going need to make a nonrefundable deposit. We all have some friends that would change their mind the last minute. This will force the people to be committed to the trip. I understand that an unexpected event might need you to change the plan. However, I don’t want to want to be the one who has to pay extra for other people decisions. Three people who signed up for the trip decided on another plan the last minute. Since everything was disclosed in the beginning, I didn’t have to struggle to find a replacement. Tip: If you don’t go, there is no refund. Second, you need to decide where to go. At first, we decided to go to Lake Tahoe because it is a well-known spot for snow-related activities. However, it is so popular that it was difficult to rent a place. Airbnb would cost almost 1k per night. The drive there is horrible because we have to drive through the mountains. The last time we went to Lake Tahoe it took us 12 hours just to drive back home due to snowstorm and road closures. After picking the location, you need to plan on how to get to the place. I divided the people into a group with the criteria of how conformable people will be in a closed space (a car) for 3 hours. There were 3 groups so 3 different cars. Since we are going to the mountain, a four-wheel drive car would be much safer. When voting on who should drive, we need to consider who has experience or who have a four-wheel drive car. Also, by using a four-wheel drive car, we didn’t have to put on chains. We were actually freaking out a little since there was a winter storm warning in effect. We even debated canceling or rescheduling the trip due to the storm. However, after much fiasco, we decided to press on. Good thing we did since it turned out the storm wasn’t even that bad! Tip: For peace of mind, bring a pair of chain anyway. Sleep in a Hotel? Airbnb? The Wild? Hotel and camping in the wild were out of the list because we wanted a house party not just a place to sleep. Airbnb was the cheapest option that would meet our goal. We rented an Airbnb home for $564 for 1 night. WOW! That’s expensive for just one night, right? Surprisingly, this is the cheapest place we can find for hosting 12 people. So it came out to be ~$47 per person (we should start considering vacation rental as an investment). The house has enough beds for everyone. Cooking utilities were included so we didn’t have to bring a whole kitchen. Since the place we rent is a house/cabin in the wood, the water heater did not build for 12 people to take a shower one after the other even though there were 3 bathrooms. Two of my friends who took a shower certainly ran out of hot water during mid-shampooing. It was sad and entertaining while I was trying to scope lukewarm water from a tiny faucet to get the soap out of their hair. Tip: Only take one shower at a time if you are staying in the cabin. Second Tip: If you want to scare someone, take them to a creepy cabin. On the first day, we ate Costco wrap for lunch. During dinner, one of my friends made spring roll. For dessert, we had homemade Thai milk tea with boba. Then, throughout the night it was party time with drinks and games. The next morning, we had bacon, eggs, cheese, croissant, fruit, and milk. As you can see, our meals weren’t fancy. Food and drink in total only cost $25/person. The beauty of home cook food is cheap, healthy, and delicious. YUM! Tip: If possible bring a friend who can cook. The snow is free for everyone to enjoy. However, we did buy a $20-day pass to do tubing. We shared 1 pass with 2 people because climbing back after tubing down the snow takes a lot of stamina. The tubing was made for children so after a few rounds, the fun diminished. We then moved on to a snowball fight. It was fun until I got hit by a very compacted snowball on the side of the head so hard that there were ringing in my ear. Being a little bit of a cry baby, some tears roll down my cheeks. After that, the fight stopped and we start building the biggest snowman ever! It was almost 8 feet tall. This was our biggest accomplishment as a group in the snow. (feeling very proud). The next day, some of us rent a snowmobile for $150/couple for 2 hours. It was a new experience and fun for the first hour. The latter half of the rental was freezing cold because we didn’t bring gloves and the snow was blasting against our faces and hands. The lesson we learned here is to always bring and wear your gloves for the snow. In total, it cost us $85 for all the activities. Our snow trip total cost was $157/person. Should we spend this much in 1 weekend? Yes, definitely! We made so many priceless memories and building friendships. Will we be able to cut down the cost further? Yes, the most expensive cost was snowmobile rental. Next time, we will stick to some free hiking in the snow instead. Are you planning on a trip soon? New article post How to Plan a Snow Trip for 12 People appeared first on We on Fire - Our FIRE Journey. If you are the owner of We on Fire, or someone who enjoys this blog why not upgrade it to a Featured Listing or Permanent Listing?